I am so excited to share a new soap making idea with you today! 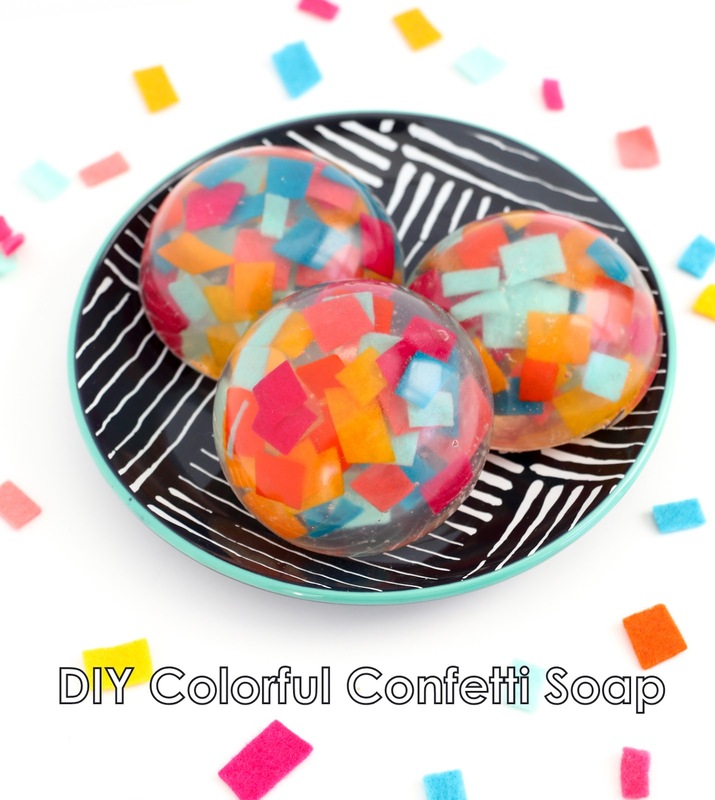 This has been one of those projects that has been on my mind for quite a while and after several failed attempts, I finally came up with a super simple and oh so cute way to make colorful confetti soap! And of course I used felt. Because I am obsessed with it! 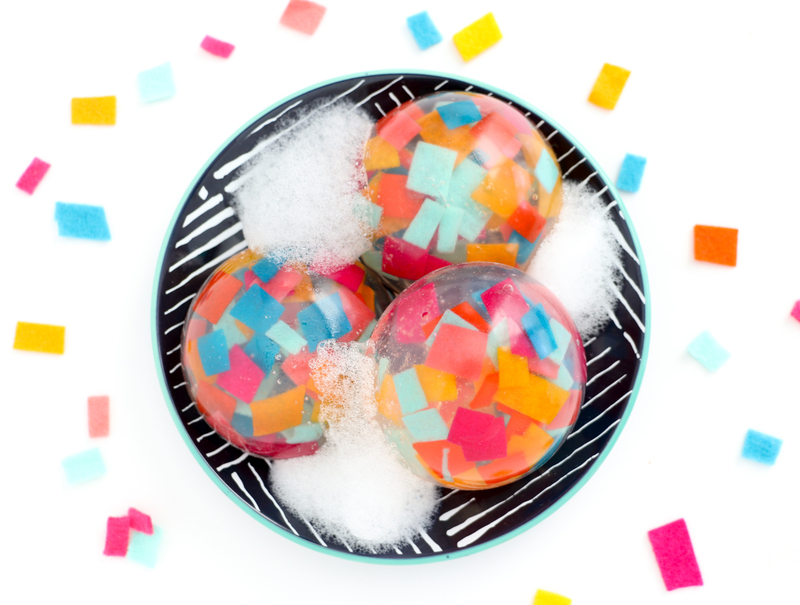 I first tried to make confetti soap using actual confetti, and while it turned out okay, it just wasn’t what I had envisioned. So after letting the idea set for a while, I realized that felt was my answer! 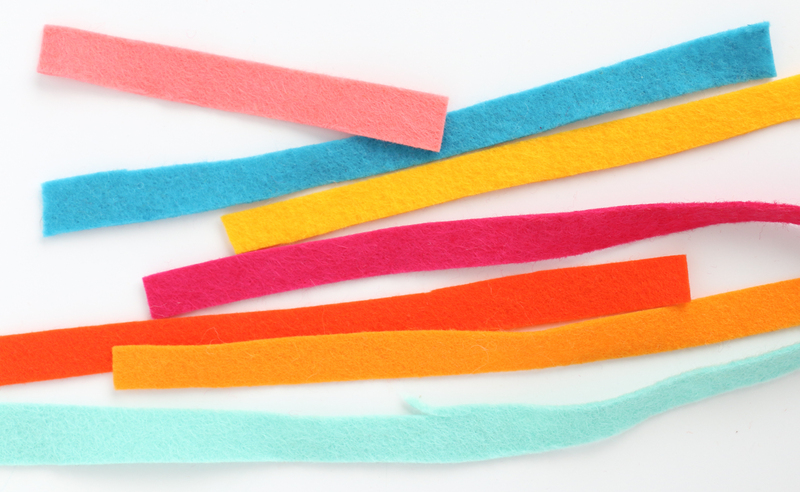 First off felt pieces can be cut into whatever shape you want and it comes in a ton of colors. Secondly the colors don’t bleed into the soap like regular confetti. And finally, it will actually gently exfoliate your skin each time you use the soap! Win-win-win! Now that I have shared the why, lets get into the how! 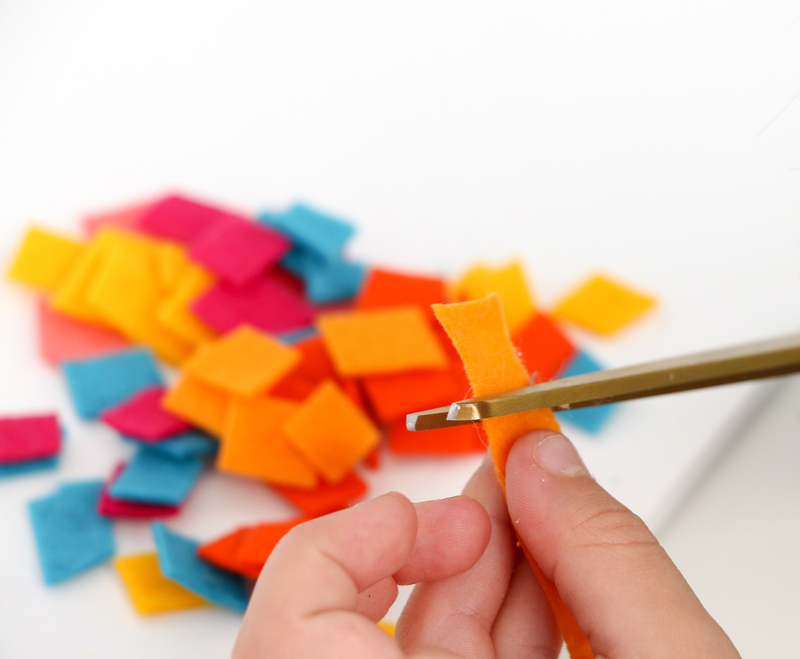 Begin by cutting your felt into strips and then into small confetti like pieces. I got a little help on this stage from my 6 year old! 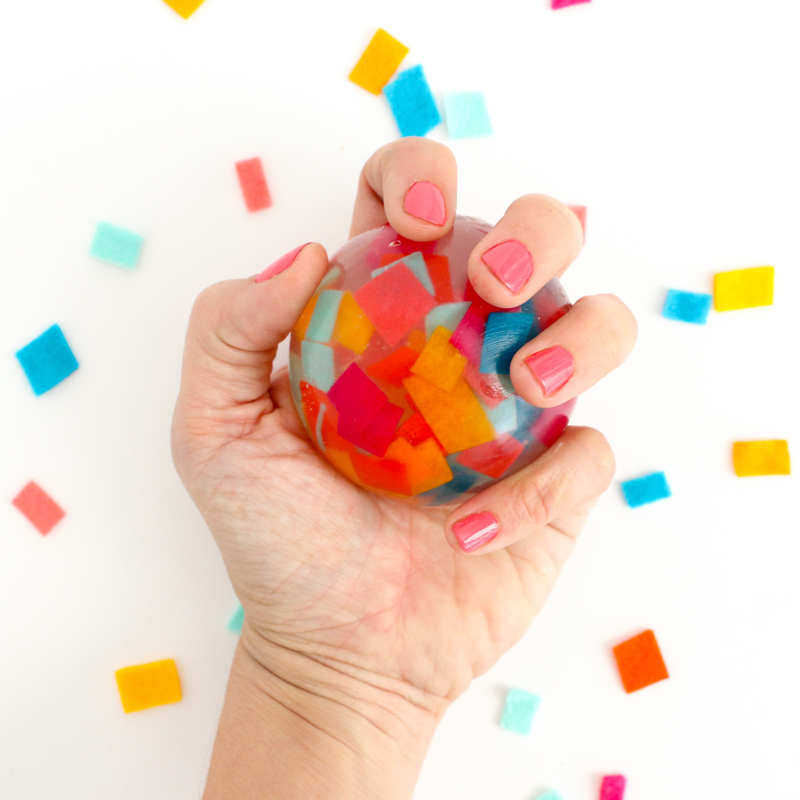 Now that you have your confetti, cut up large (about the size of an ice cube) chunks of your melt and pour glycerin soap base and fill your paper cup. Microwave the soap pieces for 20-30 seconds stir and then microwave again for 10 seconds at a time until the soap just melts. 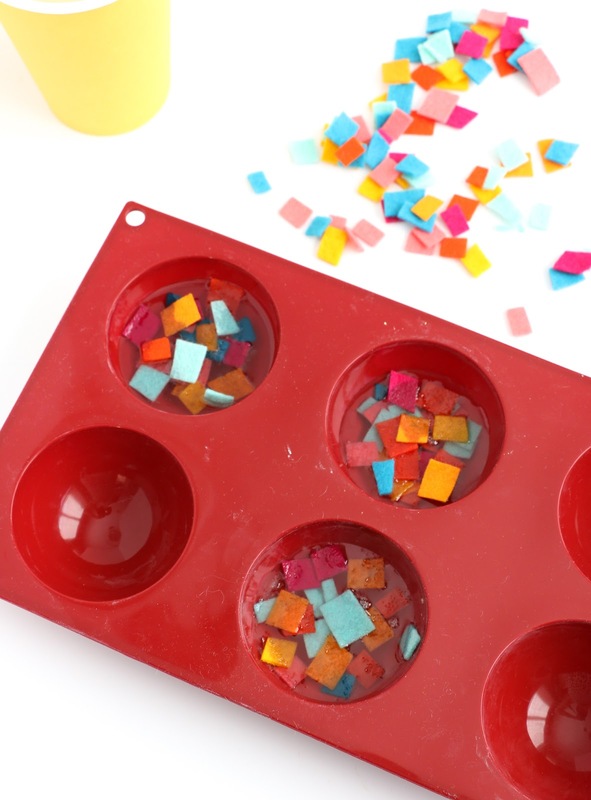 Pour the melted soap into the molds to fill them about 1/2 way, then sprinkle on the pieces of felt confetti and let it sink into the melted soap. 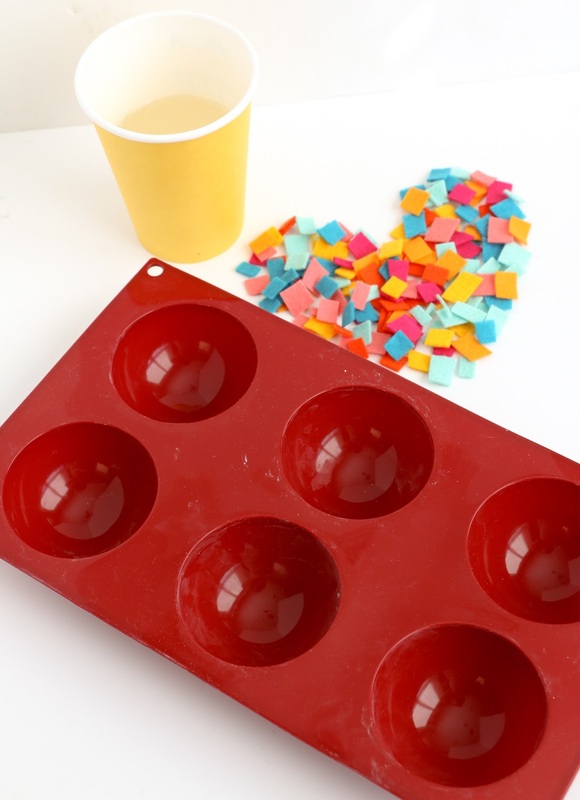 Now that you have your first layer of soap and confetti in the mold, melt another cup full of soap and fill the molds the rest of the way up. Add another layer of felt and then let the soap cool and harden. 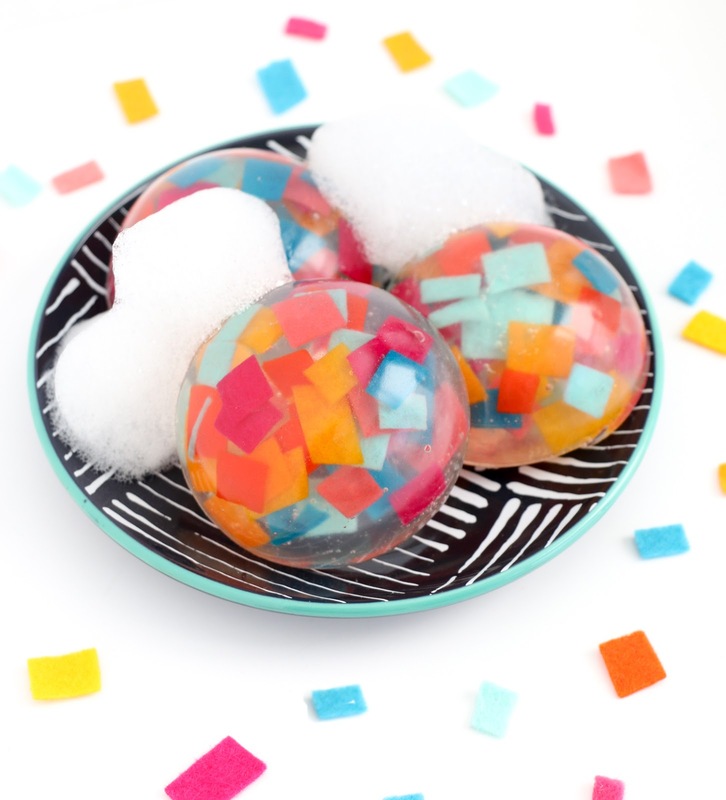 Once your soap has cooled completely (about 1-2 hours), un-mold the soap and display on a pretty dish next to your sink, wrap it up as a gift for your friends or mom, or just wash your hands and smile uncontrollably like me at all the colorful confetti goodness! What happens to the little pieces of felt? As you get down to them after using the soap for a while, they will gently exfoliate your hands. Then once they come off completely you can just throw them away. You could get the same result with chopping up piece of other colored soap and not have the worry of felt going down your drain. Yes, but usually the color from the colored pieces of soap will bleed into the clear soap base causing it to turn into an ugly brown color. I haven't had an issue with the felt falling down the drain, usually when it comes to the surface I just pull it off and throw it away. Well that feels wasteful simply for aesthetics. I guess it just depends on what you prefer. I have so many little pieces of scrap felt around from other projects that are too small to be used in anything else, so it was actually more resourceful than wasteful in my opinion. But to each their own. 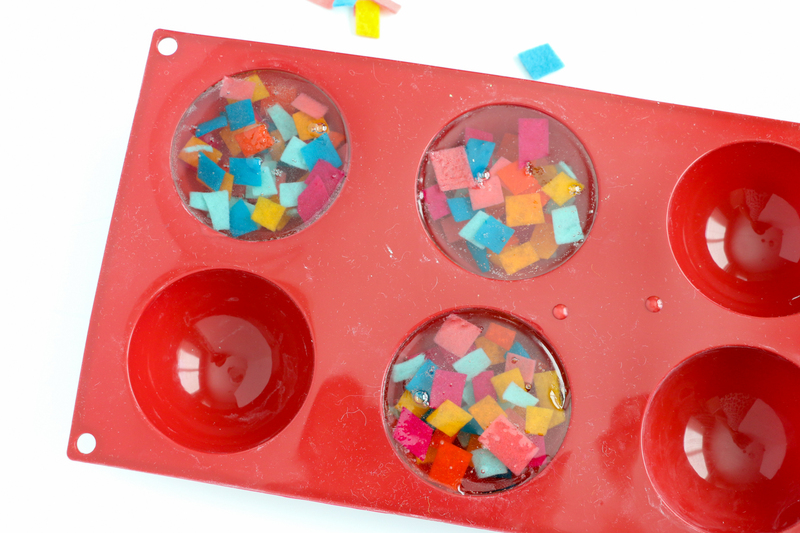 How many can you make with the 2 Lb Clear Glycerin Melt & Pour Soap Base Organic by Dr. Adorable? Can you make them scented? It depends on which mold you use, but I would say likely around 5 or 6. And yes, you can add soap fragrance or essentials oils to the melted soap. Only a few drops are needed.